Human brain development exhibits a number of unique characteristics, such as dramatic size expansion, unique cell types, and distinct neural stem cell behaviors. These characteristics are difficult to examine in model organisms such as mice and are often involved in neurological diseases unique to humans, like autism and schizophrenia. 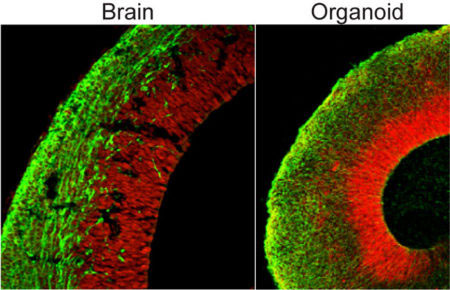 In an effort to better understand human brain development, we have developed a new model system, called cerebral organoids. Cerebral organoids, or mini-brains for short, are 3D tissues generated from human pluripotent stem cells that allow modelling of human brain development in vitro. Through a process of directed differentiation and a supportive 3D microenvironment, neural precursor tissue can spontaneously self-organize to form the stereotypic organization of the early human embryonic brain. We have previously shown that cerebral organoids can model neurodevelopmental disorders, such as microcephaly, a disorder characterized by a significantly reduced brain size. Our current interests focus on other neurodevelopmental disorders like autism and intellectual disability, by introducing mutations seen in these disorders and examining their roles in pathogenesis in the context of organoid development. Furthermore, we are studying cellular mechanisms underlying neurodevelopmental disease progression and potential therapeutic avenues. Finally, we are performing comparative evolutionary studies aimed at identifying conserved or unique factors in human brain size evolution, by introducing mutations to mimic the genetics of nonhuman primates and other mammals. These studies will hopefully shed light on fundamental questions about what makes us human and begin to tackle difficult questions pertaining to a number of debilitating neurological diseases. Generation of cerebral organoids from human pluripotent stem cells. Organogenesis in a dish: modeling development and disease using organoid technologies. Spindle orientation in mammalian cerebral cortical development. Curr Opin Neurobiol. 22: (5):737-746.